*This policy is based on a policy from the ARC Centre of Excellence for All Sky Astrophysics (CAASTRO). The ARC Centre of Excellence for Gravitational Wave Discovery (OzGrav) was established in 2017 to capitalize on the historic first detections of gravitational waves to understand the extreme physics of black holes and warped spacetime, and to inspire the next generation of Australian scientists and engineers through this new window on the Universe. The following table illustrates the founding participants in OzGrav, who all have organisational membership of OzGrav. The Administering Organisation is Swinburne University of Technology. There are 3 categories of Organisational Membership and 9 categories of individual membership within OzGrav. Individuals can represent an organisation, or be an individual member of OzGrav. However, in order to be a Chief Investigator, an individual must represent a Collaborating Organisation with membership, and in order to be a Partner Investigator, an individual must represent a Partner Organisation with membership. Support the goals, objectives and research of OzGrav. Accept the processes and procedures for joining, maintaining and leaving OzGrav. Allow the OzGrav Executive the right to refuse membership to any organisation or person at any time. Accept the legal obligations that the Administering Organisation has with the ARC. Accept the intellectual property policy of OzGrav. Accept that all disputes regarding a membership will be referred to the Research Director, based at the Administering Organisation. Accept that membership is not transferable between individuals. Affiliates: OzGrav Affiliates are researchers who have an ongoing scientific association with OzGrav, but who are not CIs, PIs, AIs or staff. OzGrav Affiliates include independently funded researchers working alongside OzGrav researchers at OzGrav nodes, or researchers who have an involvement in OzGrav not warranting membership at the CI, PI or AI levels. Affiliates are not responsible for any OzGrav research deliverables, and their typical FTE contribution toward OzGrav activities is < 0.05 FTE. Associate Investigators: Associate Investigators (AIs) are scientists who are funded from a Collaborating Organisation, Partner Organisation or other source, and are participating in OzGrav research projects with specific deliverables. Associate Investigators are responsible for making an intellectual and strategic contribution to OzGrav in their specific area(s) of expertise. AIs will typically be researchers for whom membership at the CI or PI level is not suitable for logistical or strategic reasons. Their FTE on OzGrav research is typically 0.05 - 0.2 FTE. Chief Investigators: Chief Investigators (CIs) are senior researchers employed by collaborating organisations named in the OzGrav Collaborators' Agreement. CIs are responsible for making a substantial intellectual and strategic contribution to OzGrav, and for supervising OzGrav research staff, OzGrav professional staff and OzGrav students. Their FTE on OzGrav research is typically 0.3 - 0.8 FTE. Node Leader: The Node Leader is the OzGrav leader at each node (or Collaborating Organisation). The Node Leader will drive and be responsible for all OzGrav staff at that location. 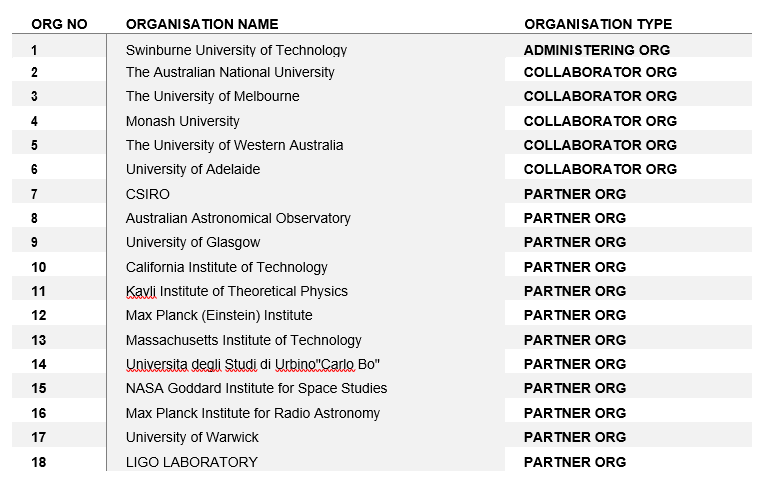 Partner Investigators: Partner Investigators (PIs) are leading researchers employed by partner organisations named in the OzGrav Multi-Institute Agreement. A PI must secure Cash Contributions and/or In-kind Contributions and/or contributions of other material resources from her/his Partner Organisation. PIs are responsible for making a substantial intellectual and strategic contribution to OzGrav. Where appropriate, they may also co-supervise OzGrav students. Their FTE on OzGrav research is typically 0.1 - 0.3 FTE. Professional Staff: OzGrav Professional Staff are employees of an OzGrav collaborating organisation who are classified on the professional/general pay scale, or are working in a professional role, and are funded from the OzGrav budget or as an in kind contribution to OzGrav. Professional staff are responsible for coordinating the administrative, financial, educational and outreach activities within OzGrav. All OzGrav Professional Staff should have an OzGrav CI or the OzGrav Chief Operating Officer as their line manager. Research Director: The Research Director is the key leadership position in OzGrav, and drives the ARC Centre of Excellence’s key activities. Research Staff: OzGrav Research Staff are employees of an OzGrav collaborating organisation who are classified on the academic pay scale and are funded at FTE 0.2 or higher from the OzGrav budget. Research staff are responsible for producing the research, technical and outreach results associated with the OzGrav milestones and, where appropriate, may also co-supervise OzGrav students. All OzGrav Research Staff must have an OzGrav CI as their line manager. Students: OzGrav students are university students (e.g., PhD, Masters, Honours students or undergraduates) who will be working with OzGrav for 6 months or longer (e.g semester-long Honours projects) whose research projects make a substantial intellectual contribution to OzGrav. An OzGrav student can be enrolled at any higher degree granting institution, but should have an OzGrav CI as an official supervisor or co-supervisor. OzGrav will consider exceptions to this on a case-by-case basis. Pre-PhDs who are working in OzGrav prior to starting their PhD are also considered students. Students working with OzGrav for 6 months or longer are eligible for an OzGrav notebook, and one of either tshirt OR hoodie. Visitors: Visitors are academics and students from outside Australia who spend time working at an OzGrav node on a research project with a CI and other research staff. Visitors enhance the collaborative work between international researchers and OzGrav researchers. An OzGrav PI may also be an OzGrav Visitor during time spent working at an OzGrav node.​ If a visitor will be continuing their work with OzGrav after they return to their home institution then apply for Affiliate membership instead. Visitors for 2 months or longer are eligible for an OzGrav notebook. Visitors for 6 months or more are eligible for an OzGrav tshirt OR hoodie. Alumni: Alumni are people who had membership status with OzGrav under one of the categories above, and who wish to join the OzGrav Alumni group so that they can stay in touch with OzGrav and receive the occasional email and electronic copies of our Annual Report. A researcher nominated as a CI must take significant intellectual responsibility for the proposed research, and any strategic decisions called for in its pursuit and the communication of results. The researcher must make a serious commitment to the project. The ARC reserves the right to determine whether a person has the requisite capacity to perform the role. He/she must reside predominantly in Australia for the full term of her/his participation in the project. If the person does not have permanent resident status he/she must obtain temporary or permanent resident status from the Department of Immigration and Citizenship before he/she may commence on the project. Nominations should be made by submitting a new member form available here. a brief explanation of the role the CI will play within the Centre and its research program. If approved by the ARC, the nominator and nominee will be notified of their membership by email. The COO will provide the CI with a copy of the ARC Funding Agreement, the Collaboration Agreement, and the Multi-Institute Agreement. The OzGrav CI will then be added to the list of OzGrav members subscribed to the OzGrav email exploder, and given member access to the OzGrav intranet. CIs cannot draw on OzGrav funds for salary support. CIs are allocated funding within the overall OzGrav budget for their travel and computing needs. A CI may resign their OzGrav membership by providing the Administering Organisation 90 days written notice. The Administering Organisation must advise the ARC of the change, and may be required to find a replacement CI. A researcher nominated as a PI must take significant intellectual responsibility for the proposed research, and any strategic decisions called for in its pursuit and the communication of results. The researcher must make a serious commitment to the project. The ARC reserves the right to determine whether a person has the requisite capacity to perform the role. A researcher nominated as a PI, at the time of her/his nomination and for the full term of her/his participation in the project must not meet the eligibility criteria for a CI. A PI needs to have a clearly defined role in Theme Plans and any related project plans. a brief explanation of the role the PI will play within the Centre and its research program. If approved by the ARC, the nominator and nominee will be notified of their membership by email. The COO will provide the PI with a copy of the ARC Funding Agreement and the Multi-Institute Agreement. The OzGrav PI will then be added to the list of OzGrav members subscribed to the OzGrav email exploder, and given member access to the OzGrav intranet. Under ARC rules, PIs are not eligible to receive direct funding from the OzGrav budget. OzGrav nodes (i.e., Australian universities participating in OzGrav) may support collaborative visits from PIs, through the OzGrav Visitor category defined below. A PI may resign their OzGrav membership by providing the Administering Organisation 90 days written notice. The Administering Organisation must advise the ARC of the change, and may be required to find a replacement PI. Nominations or applications to be an AI should be made by submitting a new member form available here. The Executive will consider their membership of OzGrav, based on the direct relevance of their research to OzGrav, their skills, abilities and experience. If the OzGrav executive approves the request, the nominator and nominee will be notified by email. The OzGrav AI will then be added to the list of OzGrav members subscribed to the OzGrav email exploder, and given member access to the OzGrav intranet. AIs do not have an allocated OzGrav budget, but they (and their OzGrav students) are eligible for most of the OzGrav competitive funding schemes. AIs will normally depart at the end of their period of appointment. AIs can resign from OzGrav or be removed by the OzGrav executive at any time. Description of planned activities, with reference to corresponding science themes and sub-projects within the OzGrav project plan. Please fill in the member form available here ​.The staff member will then be added to the list of OzGrav members subscribed to the OzGrav email exploder, and given member access to the OzGrav intranet. Unless otherwise specified, OzGrav Research Staff are allocated funding within the overall OzGrav budget for their salary, travel and computing needs. Research staff depart OzGrav when they cease to be employed under the contract through which they were appointed to OzGrav. Depending on their destination and level of continued involvement, it may be appropriate for departing OzGrav research staff to transition to another membership category within OzGrav (e.g., PI, AI or affliliate). Nominations or applications to be an affiliate should be made by submitting a new member form available here. If the OzGrav executive approves the request, the nominator and nominee will be notified by email. The OzGrav Affiliate will then be added to the list of OzGrav members subscribed to the OzGrav email exploder. OzGrav Affiliates are typically not provided with access to the intranet, unless necessary. Affiliates do not have an allocated OzGrav budget, and they are ineligible for most of the OzGrav competitive funding schemes. Affiliates can resign from OzGrav or be removed by the OzGrav executive at any time. The staff member will then be added to the list of OzGrav members subscribed to the OzGrav email exploder, and given member access to the OzGrav intranet. Unless otherwise specified, OzGrav Professional Staff are allocated funding within the overall OzGrav budget for their salary, travel and computing needs. Professional staff depart OzGrav when they cease to be employed under the contract through which they were appointed to OzGrav. For PhD, Masters, Honours and undergraduate students who will be working with OzGrav for 6 months or longer. OzGrav students should have an OzGrav CI as one of their supervisors, but we will be happy to consider exceptions to this on a case-by-case basis. Applications should be made by submitting a new student member form available here ​. If the OzGrav executive approves the request, the responsible CI and student will be notified by email. The student will be added to website, the list of OzGrav members subscribed to the OzGrav email exploder, and given member access to the OzGrav intranet. Each OzGrav node has some funding that can be used to provide travel, computing and other support for their students. It is at the discretion of the corresponding Node Leader as to how these funds are distributed and expended. Students depart OzGrav when they complete their degree requirements or complete their OzGrav-related activities (whichever occurs first). Depending on their destination and level of continued involvement, it may be appropriate for departing OzGrav students to transition to another membership category within OzGrav (e.g., AI, Affiliate or research staff). An OzGrav Visitor must be nominated by an OzGrav CI or PI. Nominations for visitor travel funding should be made by submitting visitor funding application form available here. If the OzGrav executive approves the request, the nominator and nominee will be notified by email. If the visitor is visiting for 6 months or longer the visitor will be added to the list of OzGrav members subscribed to the OzGrav email exploder. If a visitor will be continuing their work with OzGrav after they return to their home institution they may be eligible to apply for Affiliate membership. OzGrav nodes will provide office-space and access to all the required research tools. The visitor will be expected to participate in OzGrav life as requested through, for example, giving a presentation at one of the weekly seminars if requested, and assisting with graduate research students. Visitors can leave OzGrav or be removed by the OzGrav executive at any time. Normally visitor membership will end on his/her departure date, however it will sometimes be possible for these members to transition to AI or affiliate status at this time.